River Valley senior Jordan Garrison (center) hits the ball over the net, during the Lady Raiders’ straight games win on Monday in Bidwell, Ohio. BIDWELL, Ohio — A new week, and the Lady Raiders back in the win column. 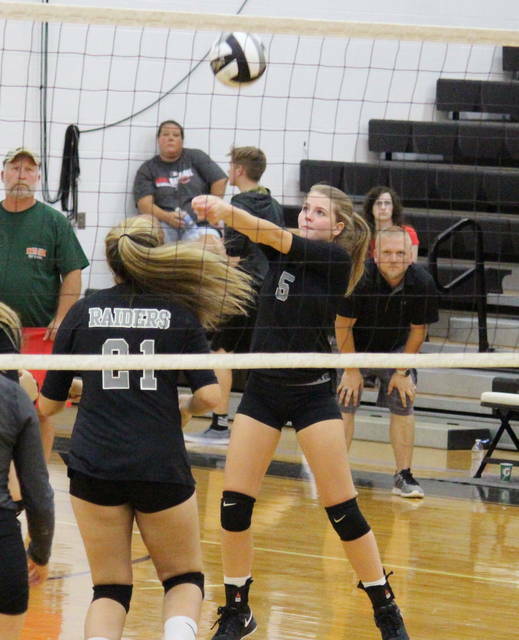 The River Valley volleyball team snapped its three-match losing skid on Monday in Gallia County, with the Silver and Black picking up a three-game sweep of non-conference guest Belpre. River Valley (6-4) led initially, but surrendered the first game lead to Belpre at 5-4. The Lady Raiders regained the advantage at 10-9 and never relinquished it on their way to the 25-21 win. RVHS took a 2-1 lead in the second game didn’t trail for the remainder of the stanza. The Lady Golden Eagles tied the game at 2-2 and 15-15, while never never falling behind by more than five, but the Lady Raiders won the second by another 25-21 count. 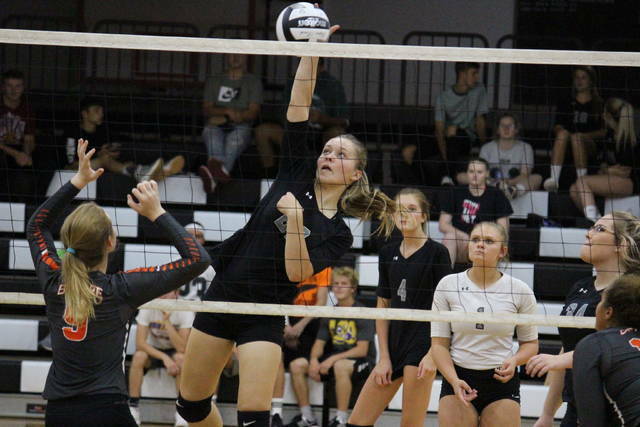 The Lady Raiders also took the advantage at 2-1 in the third game, this time stretching their lead as high as nine en route to the match-clinching 25-18 triumph. Second-year RVHS head coach Brent Smith is hoping that this win is what the Silver and Black need to snap out of the cold spell. Smith also noted one area he saw his team improve in during the match, as well as what the Lady Raiders need to work on moving forward. “I thought our passing was a little questionable at the beginning,” Smith said. 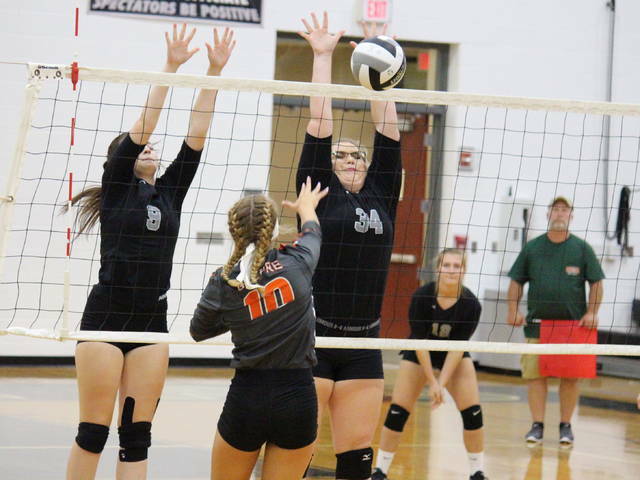 “As our passing got better and we settled into the game, our hitting increased and we were able to pull a little bit more comfortable lead on the Belpre girls, who clearly fought hard all night. 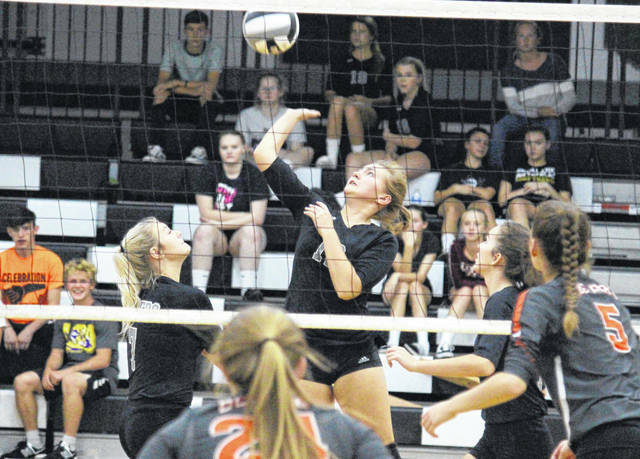 The Silver and Black finished with a side-out percentage of 63.9, a serve percentage of 90.4, and a hitting percentage of 10.Belpre had a 52.1 side-out percentage in the setback. Lora Kinney led the RVHS service attack with nine points, including one ace. Mikenzi Pope was next with eight points and four aces, followed by Kasey Birchfield with seven points and one ace, and Kelsey Brown with five points and two aces. Rachel Horner had three points on three aces, while Jordan Garrison, Cierra Roberts and Alexandria Wood each had one point, with Garrison earning an ace. Pope paced the Lady Raiders at the net with seven kills and a block. Horner had six kills in the win, while Birchfield and Brown each had two kills, with Brown picking up a block. Wood, Hannah Jacks, Jaden Bradley and Javan Gardener each had one kill for the hosts, with Kinney dishing out a team-best 12 assists. Alyssa Hutchinson led the Lady Eagle service with eight points, followed by Sydney Spencer with four. Kaitlin Richards and Hannah McDaniel each had three points, while Dekotah Lemon and Savannah Knotts marked two apiece for Belpre. The Lady Raiders continue non-conference play on Wednesday at Rock Hill.